A smooth, savvy, sardonic, gay, criminal law attorney, Ravonne Lemmelle has been hired fresh out of Harvard Law School to Savino, Martir and Associates, a large Philadelphia firm. A recently separated, single father of one, with a few acquittals under his belt, he's got a soft spot for no one, but the law. On a dark January morning, Wydell James was arrested for killing several people attending a party in Germantown: a section of North Philadelphia. Now he's in a jail cell with no one to turn to, but his childhood friend, Ravonne Lemmelle. One thing makes Ravonne feel powerful; forcing prosecutors to dig deep into their legal coffers to sit across the courtroom from him. His investigation turns up more suspects, a new purpose to kill, and Ravonne realizes the power is closer - and more obtainable - than he could ever possibly known. Things become more complex when two people enters his life: his estranged wife and a serial killer. But Ravonne's one purpose: an acquittal for Wydell James. Recommend this book to any and all readers. It gave a gay man strength, power, knowledge, family, focus, well, intelligence, sensitivity, emotion, and a sense of direction. The book is well written. Fashion blog or music playlist? Would you try another book from Rahiem Brooks and/or Derick Alexander? What could Rahiem Brooks have done to make this a more enjoyable book for you? If you could play editor, what scene or scenes would you have cut from Murder in Germantown? Almost all with involving the "hero's" child. A 5 yr. wise beyond his years whose purpose is to play sitcom cute for the amusement of the adults - and, supposedly, the readers. running commentary on what people are wearing and what music they're listening to -just not much story. I had a hard time finishing this audiobook. That being said, I am going to reverse my usual review format and discuss the narrator before the story. The narrator, Derick Alexander, actually has a nice voice. It is very smooth and deep. He needs to work on his pacing and keeping his words crisp. I found myself rewinding several times because I just could not get what he said. I think he has the potential to be a very good narrator. I hope he finds a good coach to help. I would be willing to try another audiobook narrated by him. I can hear potential in his voice.The production values were decent, better than some I have heard. 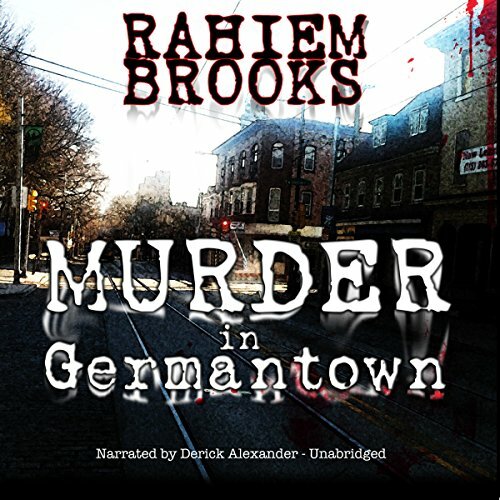 Unfortunately I do not think I will try another book by the author, Rahiem Brooks. I found the plot very confusing. I really could not follow the audio book. I purchased the Kindle version of the book after I had completed the audiobook to try to determine what I had missed. I listened to the audiobook and then read the ebook and I still do not understand what Mr. Brooks trying to communicate in those passages. I am a huge fan of mysteries, both classics like Agatha Christie and modern like John Grisham. I had hoped I would be discovering a new mystery author to explore. What I found were characters I did not care about and a plot so confused I paid for the ebook to try to figure it out. Audiobook provided for review by the narrator.